Cardinal Lories (Chalcopsitta cardinalis) are uncommon in captivity. They are endangered (CITES II) in their natural habitat in Feni, Nissan and Lavongai Islands, islands in the Tanga, Lihir and Tabor Group, and Solomon Islands. They favor mangroves, coastal plantations and lowland forest areas. 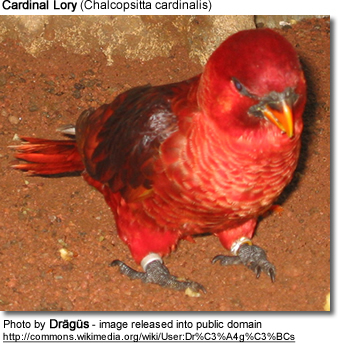 The Cardinal Lory averages 31 cm or 12 inches in length (including its long tail). The plumage is mostly red. The beak is orange and the bare skin at base of beak and around eyes is black. The irides (= plural of iris) are orange-red and the legs are grey. The male and female look alike. Juveniles can be identified by their dull orange and black bills, pale grey eye-rings, and yellow irides. 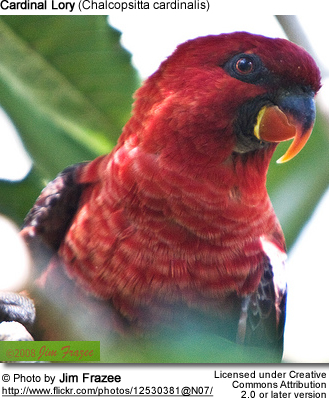 In 1989, the Solomon Island permitted few Cardinal Lories to be exported to the USA. However, because of the Wild Bird Conservation Act in 1992 the exportion of Cardinal Lories from the Solomon Islands to the USA was banned except for approved breeding.